In December 2009, after signing a contract with Kooperativa pojišťovna, a.s., Vienna Insurance Group started to implement the prestigious Main Point Karlin in Prague 8. PSJ INVEST is thus the only developer that has begun new construction in spite of the crisis and Main Point Karlin is also the only project which was already completely occupied at the time it was launched. The directorate of the Vienna Insurance Group Česká republika’s insurance companies – Kooperativa and its affiliated company Česká podnikatelská pojišťovna – will use the building’s entire space of 25,780 m2. This is the largest office transaction of last year and one of the six biggest on the office market after 1989. “An excellent location, distinctive architecture, an energy-efficient and effective concept and the green building philosophy moved Main Point Karlin on the short-list of our selection,” stated Jaroslav Suk, the Director of the Secretariat General of the Kooperativa insurance company, which is responsible for the design of the new headquarters. “The building corresponds to the conception of both companies, which not only want to obtain a friendly and pleasant environment for employees and visitors, but also a dominant headquarters worthy of the Vienna Insurance Group’s position in the Czech Republic,” Jaroslav Suk added. According to him, the Kooperativa insurance company’s Board of Directors was considering the idea of unifying 11 divisions spread over several locations in the capital city under one roof for quite some time and dozens of projects passed through their net over the last two years until the final decision was made in May, 2009. “The construction of Main Point Karlin began immediately after the contract was signed,” Project Manager Jakub Jirka from PSJ INVEST added in that the actual implementation was preceded by several intensive meetings and also a detailed verification of all the project parameters on the part of Kooperativa – from the technological solution, quality of the indoor environment, layout efficiency to the view from the individual floors. The selection of the general contractor took place in the autumn, with PSJ, a.s., winning, and construction has been underway since the beginning of December. The demolition of the existing, predominantly industrial buildings was first in line. Work on the relocation of the utility networks got underway before Christmas of 2009 and at the end of January work was launched on the securing of the excavation pit, which will last until the end of March. The construction is not easy at all thanks to the proximity of the Vltava River. “We are going three floors, almost 14 metres, under the ground and the groundwater level is already at minus four metres, which is pretty high,” Project Manager Jakub Jirka from PSJ INVEST explained. Moreover the Libeň Docks flushing channel passes through the area. “Today this is causing us problems, but we know how to resolve them and after the building is finished it will be used for very effective and ecological cooling,” he added with satisfaction. Another tough nut the developer had to crack is the footbridge to Rohanský Island (or actually more of a bigger bridge) extending right into the construction site. The developer also has a suitable, though technically demanding solution here and so the operation of the footbridge will principally not be affected even during the period of construction. “The footbridge will be supported and statically secured and a temporary staircase will be built from the side to enable the use of the footbridge even when it will be released on one side. After the construction is completed, the footbridge will be fixed to the ground floor of the new building,” Jakub Jirka explained. During the summer the construction should reach ground level and start growing upwards. Completion is planned for roughly July 2011. The interior modifications will already be performed during the construction and Kooperativa will be able to move in at the end of 2011. The project was designed by the renowned DaM atelier, which is now completing the details of the final implementation with Kooperativa and the developer. “Of course the employee facilities will be comfortably equipped, including cafeteria facilities, space for relaxation and a café,” Jaroslav Suk specified. There will also be an artificially-created water element on the expansive square than opens from the front of the building towards Florenc, making the public space more attractive. 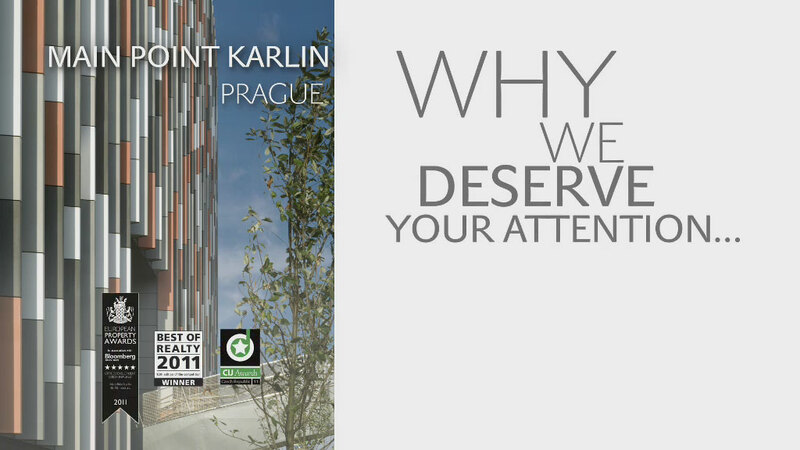 “Unique architecture, a striking building, environmentally responsible and primarily highly effective and comfortable interior spaces, that is how to describe our new Main Point Karlin project in a few words,” Martin Jaroš, the Chairman of the Board of Directors of the PSJ INVEST development company recapitulated. The design of Karlín’s new dominant feature, Main Point Karlin, was first born in 2003 and only now, after many years, are the developer’s efforts are bearing fruit. “If cost us a few years of hard work,” Martin Jaroš said.